I'm always finding spelling mistakes in the Yahoo and CNN headlines! You are so much kinder than I! 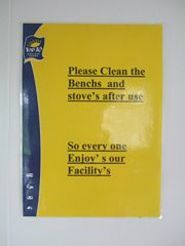 I harbor contempt for native english speakers who make such grammatical mistakes. I HOPE the pictorial examples you gave are from non-native speakers, though the one from a SCHOOL really is deplorable. Sheeze. I am totally with you. I'm a grammar hound, and have been following with delight the adventures of a guy who traveled across America fixing typos. He got some good media coverage. And there's another site, "The "Blog" of "Unnecessary" Quotation Marks"
No one under fifty knows how to use apostrophes? What a gross exaggeration. I said, "No one in the United States." As I recall, you were educated in England. Hey, like you never exaggerate. OMG I have a rant exactly like this saved up in my drafts but couldn't bring myself to run it (I get accused of being elitist and pedantic quite enough thank you!). But OH! how it galls me when I see people who fancy themselves writers saying "it's" for "its." Gar! "If I were British, I'm sure I would look down my nose at Americans and spell "jail" with a g (so sensible!)" A t-shirt site my daughter showed me has a "your retarded" t-shirt. Don't think I don't know it's you!